In a bitter and ironic twist of history, some rabbis have surrendered two hard-won victories of more than a century ago: the right to a free pulpit and to speak publicly in favor of Israel and Zionism. Both rights were secured largely through the efforts of Reform pioneer Rabbi Stephen S. Wise. In 1898, the then 24-year-old Wise participated in the Second World Zionist Congress in Basel, Switzerland, where he met Theodor Herzl. It was a life-changing experience for the young American rabbi. I journeyed to Basel merely as a delegate to a conference. I returned home a lifetime servant of the cause in the name and for the sake of which the Congress was assembled. I caught the first glimpse of my people as a people, gathered from many lands, one and undivided, not in creed but in their human faith…. Zionism became the "lodestar" of Stephen Wise's life. However, his dream of a Jewish state in Palestine was not shared by the Reform Movement's leadership. Rabbi Isaac Mayer Wise (no relation), founding president of the Hebrew Union College (HUC), strongly opposed "the colonization of Palestine," which he characterized as "a romantic idea inspired by religious visions without foundation in reality" and "not part of our creed." The Central Conference of American Rabbis' 1885 Pittsburgh Platform, formulated by 18 prominent Reform rabbis, promulgated this anti-Zionist view in one of its planks: "We consider ourselves no longer a nation, but a religious community. We, therefore, expect neither a return to Palestine nor a sacrificial worship under the sons of Aaron, nor the restoration of any of the laws concerning a Jewish state." Notably, one of the platform's principal authors, Rabbi Kaufmann Kohler (who would later become HUC president), felt so strongly about the matter, right after officiating at Stephen S. Wise's marriage to Louise Waterman he warned her of her husband's "meshugass" (craziness or foolishness) for Zionism. But to Stephen Wise, Zionism was no meshugass. It was a mission, and he would not be deterred by HUC's anti-Zionist leadership. In late 1914, Wise arranged for one of his closest Zionist colleagues, Professor Horace Kallen of the University of Wisconsin, to address HUC students on "The Meaning of Hebraism," a code word of that era indicating a Zionist perspective. But as the date of the lecture neared, HUC President Kohler sent Kallen a curt telegram disinviting him: "The authorities of Hebrew Union College…have commanded me to cancel said invitation because of your [Zionist] views, which they oppose." Writing to Rabbi Max Heller, a fellow Zionist, Wise voiced his fury at the abrupt cancelation of a respected professor's speaking invitation: "Is there nothing to be done to end once and for all that bigoted [anti-Zionist] attitude which stifles every expression of opinion that differs from the gentlemen of the College…?" Eight years later, Wise had gotten nowhere in his quest to break through HUC's entrenched anti-Zionism. So in 1922, for this and other reasons, he established a rival Reform seminary, the Jewish Institution of Religion (JIR), in New York City. There he ordained more than 200 men, influencing several generations of rabbis in building strong support for Zionism (though, in the spirit of diversity and free expression, he also hired anti-Zionist professors such as Rabbi Emil G. Hirsch to serve on JIR's faculty). JIR would merge with HUC into the Hebrew Union College-Jewish Institute of Religion in 1948, the year the Jewish state was established. Wise, near death, agreed to the merger in part because several months earlier, Rabbi Nelson Glueck, a committed Zionist, had been installed as HUC's president. In 1905, after having served Congregation B'nai Jeshurun in New York City and Congregation Beth Israel in Portland, Oregon, the 31-year-old Wise interviewed for a position at Manhattan's Temple Emanu-El. A series of tumultuous meetings with Emanu-El's lay leadership ensued as Wise demanded the freedom to preach from the pulpit as he saw fit: "If I go to Emanu-El, the pulpit must be free while I preach therein….If I accept, I must have an absolutely independent pulpit, not dominated or limited by the views and opinions of the congregation." Emanu-El's most prominent lay leader, Louis Marshall, who later became president of the American Jewish Committee, told Wise straight out that he would not be allowed to use the pulpit to discuss certain topics, including Zionism. Nor could his sermons convert "the pulpit into a forum of character entirely foreign to the purpose for which the congregation was founded." The chief office of the minister…is not to represent the views of the congregation, but to proclaim the truth as he sees it….How can a man be vital and independent and helpful, if he be tethered and muzzled? A free pulpit, worthily filled, must command respect and influence; a pulpit that is not free, howsoever filled, is sure to be without potency and honor…. Wise's protest became front-page news in many newspapers, including The New York Times, and helped secure the principle of a free pulpit for the rabbis who followed in his wake. As for the Temple Emanu-El position, there are those who maintain that Stephen S. Wise turned it down, while others contend that the job was never offered to him. In any event, Wise did not become Emanu-El's rabbi-nor would he again serve any other existing congregation. Instead, in 1907 he established the "Free Synagogue" in New York City-now the Stephen Wise Free Synagogue-and in doing so, he declared a new mission for the synagogue: "Believing that the power of the synagogue for good depends, in part, upon the inherent right of the pulpit to freedom of thought and speech, the founders of the Free Synagogue resolve that its pulpit shall be free to preach on behalf of truth and righteousness in the spirit and after the pattern of the prophets of Israel." 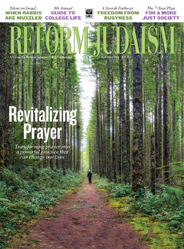 In time, a free pulpit became a fundamental part of North American synagogue life, rabbis in all Jewish denominations proudly preaching provocative sermons and inviting controversial speakers to address their congregations. Today, Stephen Wise's victories are undermined whenever rabbis cannot freely express their viewpoints on Israel. The lesson is clear: Battles of conscience must be fought again and again to uphold fundamental freedoms. Rabbi James Rudin is the American Jewish Committee's Senior Interreligious Advisor. His latest book, Pillar of Fire: A Biography of Rabbi Stephen S. Wise, will be published by Texas Tech University this November.